Sticking (mostly) with the winter theme that I’ve been thinking about lately, Marc-Aurele Fortin is another artist in whose works winter figured prominently. Fortin was a contemporary of the Group of Seven painters and he focused on scenes of small-town Quebec, his native province, and the landscape of the surrounding St. Lawrence River Valley. Because he was so prolific a variety of styles can be seen in his work, but many of his paintings are typified by vibrantly colored houses and hillsides, dramatic skies and billowy cloudscapes. While Fortin’s art is available through several prominent galleries, the Artnet website is one of the better resources to see a wide variety of his work in a single place. More background on these images can be found in the City of Toronto Archives here. Not far from the Confederation Bridge on the Prince Edward Island side of that engineering marvel a scenic backroad leads to the cozy town of Cape Traverse and two of the best antique shops in all of Canada’s Maritime Provinces: Ice Boat Rarities and Antiques and, its sister shop, Island Uniquities and Antiques, which is just a few hundred yards away down PEI Route 10. Both shops are housed in 19th century buildings — one an old church and another a former masonic lodge — that have been masterfully restored and updated by owners Larry and Jane Dugdale. The exceptional assortment of antiques, curios, artwork and furniture on offer started as a personal collection of the owners that eventually morphed into the well-organized groupings that seem intentionally curated for visual delight. The Ice Boat building features the former church’s simply designed but stunning original red, blue, green and yellow stained glass windows, which cast a warm, luminous glow throughout the place. These shops deserve to be called galleries as much as anything else. If you’re into stylish old or reclaimed furniture, these shops have you covered; automotive and industrial neon, check; vintage toys, thermometers, oil cans, model boats, duck decoys, postcards and ephemera, tools or farm implements, check to all that too — and a great deal more! Of particular note is the collection of whimsical painted wood sculptures and other artworks by noted PEI folk artist, Kerras Jeffery, who sadly passed away last year at way too young of an age after battling a long illness. The Ice Boat Rarities shop serves as almost a museum of some of his brightly colored pieces and the shop also features a marvelous cloud-painting by Jeffery on the ceiling of its largest room. In addition, the staff in both places are super friendly and helpful and the prices are about the fairest I’ve seen for antique shops anywhere. These places are definitely worth a visit if you find yourself nearby. More information about these terrific shops can be found at their respective Facebook pages here: Iceboat Rarities and Island Uniquities. More about Kerras Jeffery and his art is available on the Backroad Folkart blog here, which was formerly written by him and is now maintained by one of his relatives. In Nova Scotia’s Annapolis Valley wintery weather maintains its grip late into March as the province bounces back from the fierce winds and driving snow of this past week’s Noreaster. Although this old relic of a farm combine sits in a forlorn state shortly after the storm, it’s a beautiful piece of machinery with its pops of orange-red on the wheels and threshers contrasting nicely with the muted colors of the rest of the combine and the bleak surroundings. I’ve seen the street photography of Fred Herzog previously but a brief essay by Geoff Dyer in today’s New York Times Magazine prompted me to look anew at Herzog’s work. Herzog came to Canada in the early 1950s from Germany and from the late 1950s through the 1960s pioneered color street photography in his adopted city of Vancouver. His candid shots provide a splendid if unvarnished documentary of the city and its people during that period. The vintage images also subtly illustrate many things that have changed in Vancouver and other urban areas throughout Canada (and America) in the past several decades. More of Herzog’s work can be seen at Vancouver’s Equinox Gallery and on its website. Rustic Old Barn, Phinney’s Cove, N.S. Aside from its overall weathered appearance and striking shades of blue, this barn stands out for its second-story house-style doors and its slightly asymmetrical design with an upper window thrown in for good measure. Because I love doing projects that involve hand tools I probably have way more than any reasonable person should have. But if you work enough with your hands you know that the right tool makes all the difference. Traditional hardware stores are now a dying breed of retail but back in the day they were the one-stop shop for most tool needs. The McLennan, McFeely & Co. Hardware Store opened in Vancouver in 1885 and for many years was a substantial business enterprise. These pages are from that merchant’s 1912 catalogue. Among the wrenches above, the crescent adjustable wrench must have made quite a splash because it was only first introduced around 1907 and to this day is a standard in any well-equipped tool box. Though less common nowadays, variations of the hand drills pictured below can still be found today and are quite useful. The City of Vancouver Archives has digitized some of the old McLennan, McFeely catalogues, and flipping through the pages makes for an interesting diversion as you ponder how much more laborious it was to do various chores over a century ago. Songbooks fascinate me, particularly when they highlight song variations from earlier times. So while browsing through a dusty stack of materials in a used bookstore a few months ago I was drawn in by this 8-page vintage booklet of songs, which was printed as a promotion around 1930 by the Dominion Life Assurance Company of Waterloo, Ontario. This bit of ephemera is spare of graphics and contains a wide variety of songs, including songs specific to Canada (such as “O Canada!” and “Alouette”), American standards (“Home on the Range” and “She’ll Be Coming’ Round the Mountain”), and songs indicating the then closer historical connection to Great Britain (“God Save the King” and “Loch Lomond”). A few of these have lyrics that would not be considered racially sensitive but presumably reflected the time back then. It’s an interesting mix of tunes, many that I’ve not heard in ages and others for which I only knew a line or two of the lyrics. Although these vintage images only showcase a humble gas station they’re amazingly good! That’s because they combine the modernist industrial design of distinguished Toronto architect John Parkin and the often-dramatic photography of Hugh Robertson and his team at Toronto’s former Panda Associates firm, both of whom helped popularize modern design in Canada during the 1950s and 60s. A trove of other vintage architectural photos can be seen at the Panda Associates Digital Image Collection, Canadian Architectural Archives, which is maintained by the University of Calgary, and in the book John C. Parkin, Archives and Photography: Reflections on the Practice and Presentation of Modern Architecture (University of Calgary Press 2013). Quiet Morning Along the Rocky Shore, Kejimkujik Seaside, N.S. As many know, throughout 2017 Canada has been marking its 150th anniversary as a confederation. Of course, the history of the country is much richer and extends more than twice as far into the past. More notably, in recent years Canada has truly shined as a stellar example on the world stage. Like any country, it has its issues but it generally gets a lot of things right and that resilient effort, its vibrant culture and its wonderful people deserve immense appreciation. Best wishes on this day and in this year and for 150 more! Many people associate Calgary, affectionately nicknamed “Cowtown”, with its annual summer Stampede in the same way that a place like New Orleans is tied to Mardi Gras. The character of those places seems inextricably linked to these major civic festivals. Prior to the area’s post-WWII oil boom, Calgary was predominantly an agricultural area and held a traditional yearly agricultural fair called the Calgary Industrial Exhibition. The Stampede was conceived in 1912 by an American rodeo promoter, Guy Weadick, as a way to add a cowboy-themed element to the fairly staid farm-focused Exhibition. After some fits and starts the two events combined in 1923, with the Stampede under Weadick’s longtime guidance eventually overshadowing the Exhibition. Ever since, the cowboy theme has stuck with Calgary even though agriculture, farming and ranching are now only a very small part of its economy. This year’s Stampede will take place July 7-16 and, as can be seen on the official Stampede site, will be quite a spectacle with something to offer just about everyone. Distinctive industrial design reveals itself in many ways and, when done well, can be a genuine pleasure to take in. While the specialness of such design is often difficult to see in our contemporary surroundings, its otherwise subtle impact jumps out when looking back at vintage images. A case in point: the humble municipal bus, operated in Toronto, Montreal, Vancouver, Calgary and other cities across Canada. Over this period theses buses began to display a very mod sensibility as they evolved from the severe boxiness of earlier 1930s and 1940s versions to later, during the 1950s through the 1970s, being adorned with more rounded contours, sleek curves and very stylized lines and chrome elements. Our fresh snow cover here this morning sent me looking for some wintery inspiration, which I happily found in the wistful watercolors of Saskatchewan artist Bob Pitzel. Pitzel’s art captures the stark and vanishing rural landscapes of western Canada, typified by imposing grain elevators, graying farmhouses and sheds that dot wide expanses of prairie, and weathered fences erected more as barriers against the elements than to fence in or out people or creatures. More about Pitzel and his wonderful watercolors can be found on his artist site here. I’m definitely an amateur photographer at best. So I was pleased to be asked recently to allow a photo I’d taken of a simple, well-worn pew inside an old church on the Nova Scotia shore to be used for a poster for an upcoming concert by Acadia University’s distinguished Manning Chapel Choir. Of course, I was more than happy to do so (and the request made my day)! The sunset concert of Compline, or night prayers, will be sung, appropriately, in a former old church in the small town of Harbourville on the Bay of Fundy about a week before Canada’s Thanksgiving Day. The concert poster is above and the original blog post and series of photos that prompted the request is here. More about the concert and the Manning Chapel Choir can be found here. “I’m so glad you’re here . . .
Pathway Near the Earthworks, Fort Anne, Annapolis Royal, N.S. Hillside Cannon, Fort Anne, Annapolis Royal, N.S. The intricate artistry of wood engravings amazes me and Canada has its fair share of accomplished artists in this medium. Chief among them is H. Eric Bergman, who emigrated from Germany in 1913 and made Winnipeg, Manitoba his home throughout a highly productive career until his passing in 1958. Images from the Canadian wilderness figure prominently in many of his very stylized and moody works. Annapolis Royal occupies a special place in both the far western part of Nova Scotia’s Annapolis Valley and the province’s history. Situated on the sweeping Annapolis River, the site was originally called Habitation at Port-Royal by French settlers around 1605 and was the capital of French Acadia. In 1710, the settlement became the first capital of Nova Scotia during British rule. The charm of this small town is typified by its wide variety of doors and entryways, many of which hint at the town’s early history and its seaside heritage. Here’s a sampling from a recent stroll on a brisk fall day. Colorful Shop, Annapolis Royal, N.S. I must say, very impressed that you would travel all the way up to Capstick, Nova Scotia to take wonderful pictures of that area. Ironically, the lead picture on your O’Canada website is of our family property. Every now and again I do a Google search of images on Capstick to see what pops up and your website did appear. The picture of the grey home in your Blog called ‘Gentle Waves Near Capstick, Nova Scotia’ is actually my Uncle Peter’s home. Unfortunately, arsonists burned down that home about 3 years ago and my cousin had to go after them in court. Each year the Canadian Breast Cancer Foundation launches a calendar to raise money called ‘Shop 4 Charity Calendar Sweepstakes’. 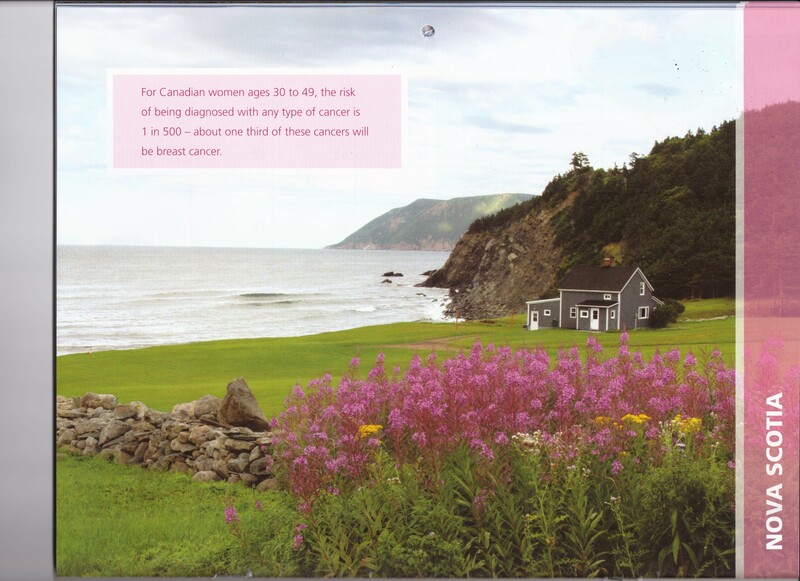 This year the calendar highlighted a picture representing each Province and Territory in Canada. As I sat in my home office, the 2015 calendar was up on my cork board and when I flipped to the month of July the Province of Nova Scotia was represented by a picture. I grew up going to Capstick every summer in the 1970’s and visiting Uncle Peter and Aunt Irene Kanary in that grey home. Our home (the original home from 1914) was just above Uncle Peter’s home closer to the road but it was burned down about 10 years ago. Our family settled in Capstick back in 1840 from Ireland during the Potato Famine. The community was basically two families, the Capsticks and the Kanary’s. Not sure why they got their name on the community. Must have been there first. Thought you might find this little tidbit interesting about your own website.